WASHINGTON — The Department of Homeland Security on Friday released the names of only 22 visitors to President Donald Trump's Mar-a-Lago property, despite being ordered to make its full visitor list public after being sued by watchdog groups. 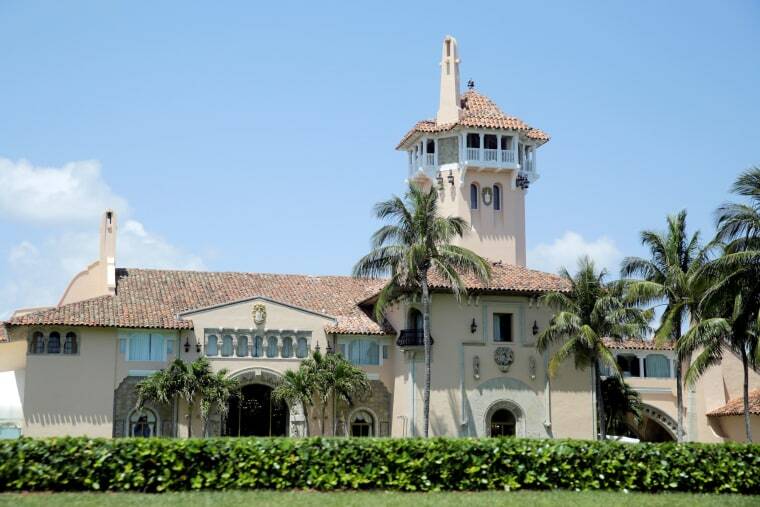 A judge had ordered that the names of all visitors to the club in Palm Beach, Florida, since Trump's inauguration be released by noon on Friday, a deadline that had already been extended by a week. The list of names was turned over "at the last minute" — nearly half an hour after the deadline had passed — one of the plaintiffs, Citizens for Responsibility in Ethics in Washington (CREW), said on Twitter. In a statement, the group vowed to fight the administration's action in court, and said it was "spitting in the eye of transparency." "The government does not believe that they need to release any further Mar-a-Lago visitor records," said CREW. "We vehemently disagree. The government seriously misrepresented their intentions to both us and the court." In a letter, the government said the unreleased records relate to the president's schedule, and it believes that that "information is not subject" to freedom of information requests. The 22 names that were released Friday were all from Japanese Prime Minister Shinzo Abe's trip to the resort in February. A Democratic super PAC, American Bridge 21st Century, said it knows the identities of more than a thousand visitors to the resort since the inauguration in January. "When all is said and done the Trump administration will be remembered as the most corrupt and secretive administration in American history," Shripal Shah, the PAC's vice president, said. "Based on public reporting we've collected the names of more than 1,100 Mar-a-Lago visitors since Trump was elected." Among the visitors spotted by reporters were New England Patriots owner Robert Kraft, golfer Ernie Els, real estate tycoon Steve Wynn and Florida Attorney General Pam Bondi. The records affected by the court order cover visitors to the club from Jan. 20, Inauguration Day, to March 8. Trump spent seven of his first 14 weekends as president at Mar-a-Lago, promoting concerns over cost and ethics among experts and watchdog groups. The club is not a just a presidential retreat, but a venue where Trump has hosted foreign heads of state, including Abe and Chinese President Xi Jinping. He has also golfed with undisclosed partners — an activity aides rarely confirm despite requests from White House reporters to know when he golfs and who joins him on the course. But part of the impetus for the suit was to ensure that records were being kept — and if so, how. Trump's trips to Mar-a-Lago: How much are they costing taxpayers? The groups that sued the government for the logs — CREW, the National Security Archive (NSA) and the Knight First Amendment Institute at Columbia University — also sued for visitor records of Trump Tower and the White House. The lawsuit remains pending for the White House logs, but DHS maintains they have no records of visitors to Trump's Fifth Avenue property. The White House decided in April that it would keep its visitor logs secret, reversing an Obama-era precedent of releasing logs after CREW sued for them. Though the Obama administration was praised for its transparency when it began releasing the logs in 2009, the records could be incomplete with names redacted for various reasons — a practice the Trump White House called out as "faux" transparency while arguing their own logs should be kept secret due to "grave national security risks and privacy concerns" of White House visitors.